In Altar you can disassemble unused heroes for spirits, promotion stones, magic dusts, and soul stones. Equipment, crystals and artifacts of disassembled heroes will be returned to the backpack. Idle Heroes Strategy Game Guide. 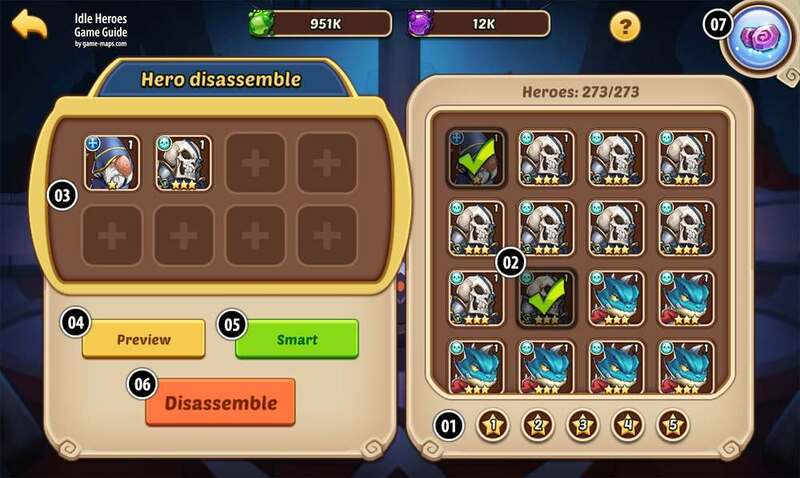 Altar / Hero disassemble in Idle Heroes. All the heroes of ⭐ (one star) or ⭐⭐ (two stars) that you find in the game have no practical use except in the Altar. So you can disassemble them out immediately. Each ⭐⭐⭐ (three stars) hero found in the game can be used in the Creation circle. So do not disassemble them, just wait until you can use them for fuse. The normal set for fuse is 4 same characters, so if you have to make free space in your inventory for new hero, leave at least 4 same ⭐⭐⭐ (three stars) or multiples, for example, 8 heroes. If you have more then 8 you can disassemble them. Each ⭐⭐⭐⭐ (four stars) hero can be used for Fuse in the Creation circle. Therefore, never disassemble them. Do it only if you do not have free space in the inventory. Disassemble each ⭐⭐⭐⭐⭐(five stars) hero or above makes sense only if it is a very conscious act, which you think well. Remember that getting a ⭐⭐⭐⭐⭐ (five star) hero in a game is difficult. Here you can see what components you will receive after decomposing selected heroes. You can safely select this option, the heroes will remain undecomposed. It is not "smart" do do not use this option. Heros can be disassembled into a mixture of spirits, hero advance stones and soulstone shards. Hero advance stones can advance heroes for betterstats and new passive skills. Soulstone shards can buy powerful heroes in the hero store.